Under their Carddass name Bandai has produced a Collectible Card game similar to the concept of Magic: The Gathering. The Cards are split up into four Separate teams. 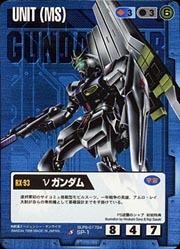 Each team has their own wide range of mecha at their disposal. The Gundam RX78-02 Model is only the second model in Bandai's Perfect Grade Series the first being Evangelion Unit-01. The Model is nothing less than outstanding. The model stands 31cm high with a scale of 1/60. Hobby Link Japan puts it well when said "The most striking aspect is the incredible level of INNER detail." It also features light up eyes which run on a watch battery. The price for this excellent model is 12000 Yen and can be ordered from Hobby Link Japan or Rainbow Ten as well as other anime retailers. Final Fantasy VIII has been released. The game does have a new territory lock out feature but it can be bypassed with a Game Shark / Pro Action Replay with the code "D009D182 0000" + "8009B182 2402"
Media Works, the Company in Japan who publishes the B-magazine has began publishing a new Hobby Magazine called "Electroshock Hobby Magazine"
Submit News for AnimeDX's News page!